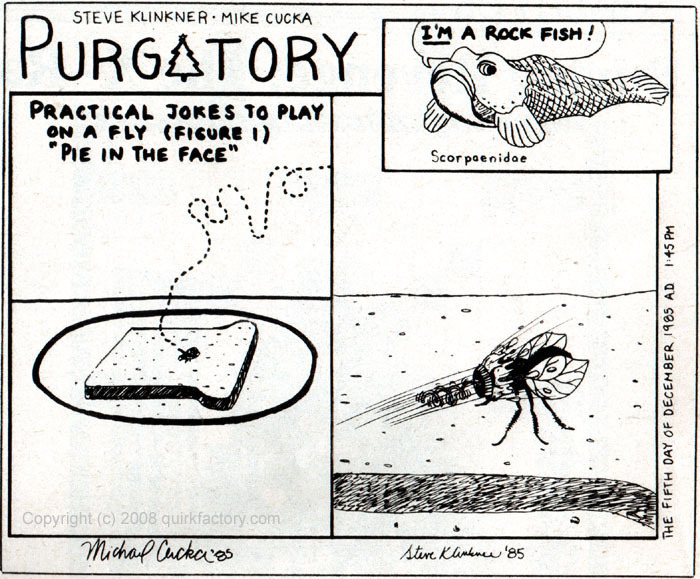 Purgatory is a set of cartoons done with Mike Cucka for the the Johns Hopkins Newsletter in 1985. They were fairly esoteric and hence not well-liked by the newsletter editor at the time. That makes them more enjoyable to me. Because the cartoon series was fairly esoteric, we featured a series of thumbnail cartoons which were all pun variations on "rockfish". It was a certain sign that someone didn't understand the cartoons when they commented that they enjoyed the rockfish jokes. This cartoon depicts a Halloween scene. It is particularly treasured because it generated an editorial protest letter due to its religious themes. The primary intent was a commentary on hypocritical behavior. I often think of this one when people refer to the proverbial "carrot and stick". Flies are annoying - why not get some revenge by playing a few jokes on them? I like this one simply because it is absurd. 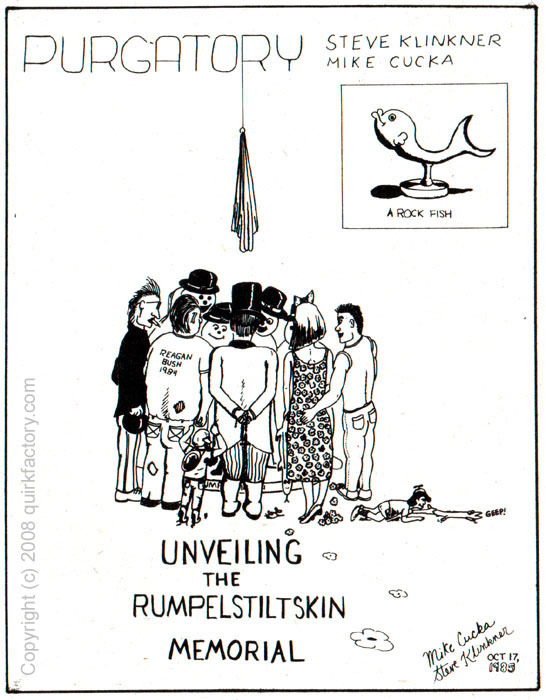 This cartoon explors the question: What would it look like if Rumpelstiltskin had a statue? Why indeed would he have one? 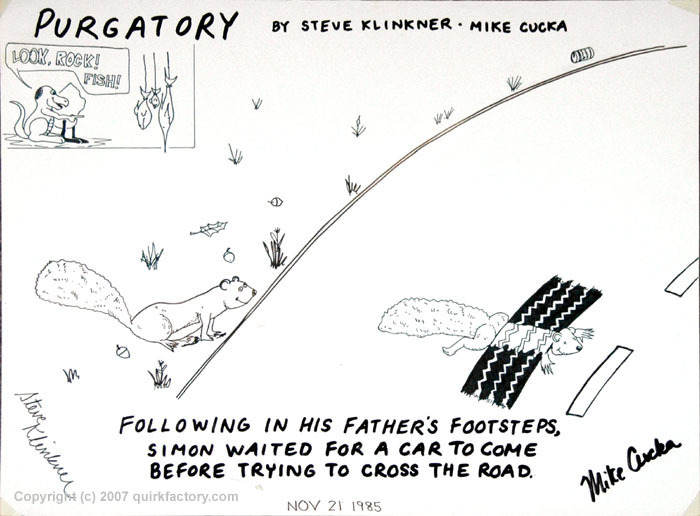 Simon crossing the road is an observation of squirrels' tendency toward running in front of cars, as well as human inability to learn from others' mistakes. 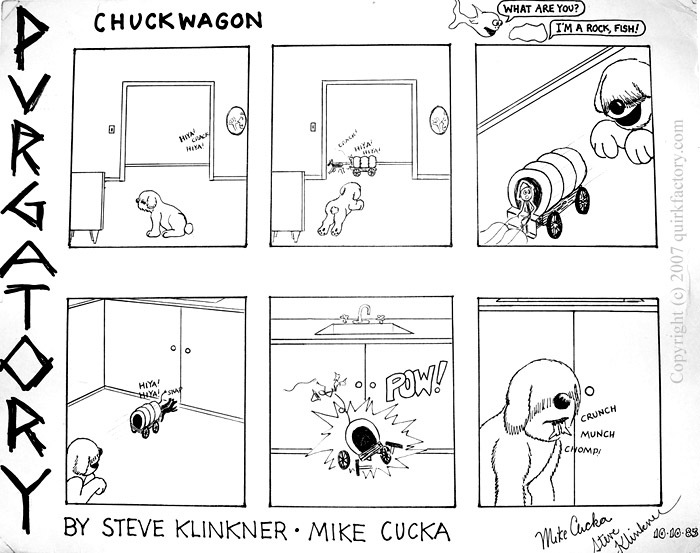 We always wondered why it had to be that the Chuck Wagon always got away. It doesn't have to be that way. 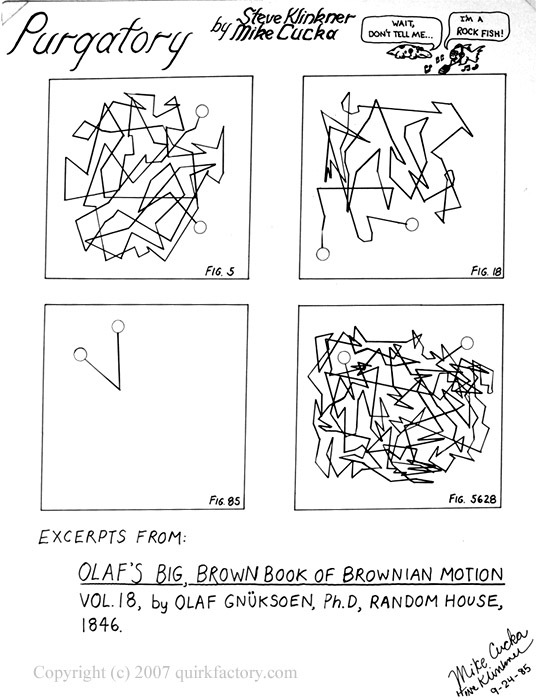 Interestingly, I saw Stephen Wright in concert about 5 years after this cartoon, and he made essentially the same joke (I draw no conclusion from this except that good ideas arise in many places). There's never a shortage of folks willing to decide what's good for you on your behalf. This next cartoon relates to a then-popular series of football advertisements in which a video replay is shown and the viewer is invited to "make the call" prior to hearing the official ruling.